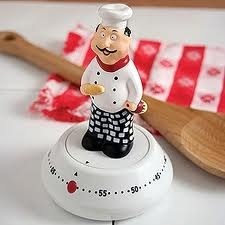 Then, someone gave me a kitchen timer and changed my life. 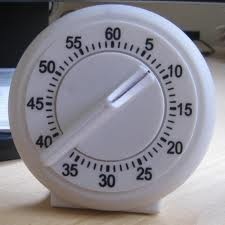 I read about a little known sport called the “15-minute boogie scoot.” You simply set the timer for 15 minutes, scoot around the house, clearing it of clutter and dust. It’s amazing what you can accomplish in 15 minutes when you’re totally focused. When the buzzer goes off, you quit. You’re done and free to get to the fun stuff. However, nine times out of ten I find I’m on such a roll, that I wind it back up and do another 15 minutes. It also helps to have a little soundtrack going in the background. Some days it’s a Gregorian chant and more often it’s Keb Mo singing the Delta blues. This also works for small tasks like cleaning off your desk. When the stack of stuff gets so high you can’t see over it, simply apply the boogie scoot. Don’t worry about finishing – you can do another 15-minute workout the next day (or next week). Before you know it, you’ve got a clean desk with important papers neatly filed away. This week I took the timer out into the garden where those 15 minutes really flew by. If I only do two boogie scoots a day, that amounts to 3-1/2 hours a week. Had I tried to do all that at once, I would have been overwhelmed and probably died of a heat stroke. This week I decided to incorporate my boogie scoot exercise while grocery shopping. Not only did I curb my spending, but I cleared the store when other shoppers heard something “ticking” in my handbag. I was in and out with seconds to spare. I’m saving up for the “Talking Chef Kitchen Timer at left. My goodness, how did he know?! This entry was posted in Good housekeeping and tagged 15-boogie scoot, Magic of the kitchen timer, Motivation to clean house by Emily Jones. Bookmark the permalink. I always love your wisdom and humor. Emily, this is terrific!! Maybe I can finish ironing and get the house back in order in one week!!! I adhere to the Scarlett O’Hara philosophy: “I’ll think about that tomorrow.” But I may plug into the 15-minute scoot occasionally—-it’s a thought.